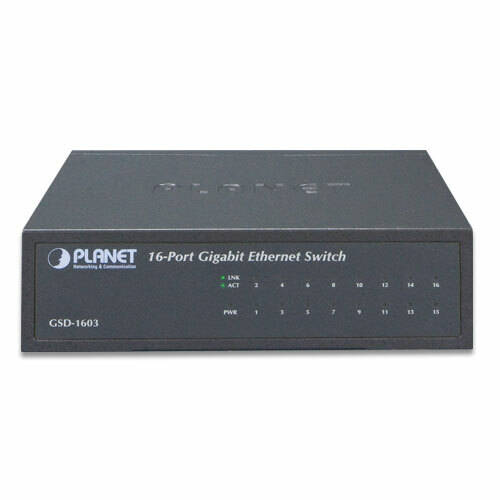 PLANET GSD-1603 Gigabit Ethernet Switch provides 16 RJ45 10/100/1000Mbps ports for high-speed network connectivity. 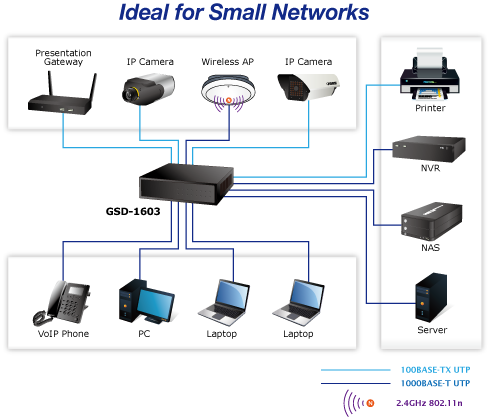 It can automatically identify and determine the suitable transmission speed and half/full duplex mode of the attached devices with its 16 Gigabit ports that support 9K jumbo frame feature. 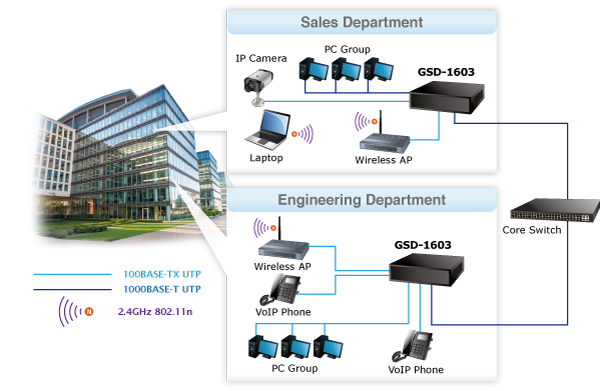 Therefore, the GSD-1603 can handle extremely large amounts of data transmission in a secure topology linking to a backbone or high-power servers. The GSD-1603 incorporates two advanced green networking technologies and is able to provide power saving up to 40% less energy but maintains high performance efficiently. The Hibernation Link Down power saving goes beyond IEEE specifications to automatically lower power consumption for a given port when it is not linked. With the Hibernation Link Down power saving technology, the GSD-1603 will automatically adjust power usage of the ports that are shut down or not connected to network device. Intelligent scales power, the other technology adopted, is an intelligent algorithm that actively determines the appropriate power level based on cable length. When the GSD-1603 is connected with Ethernet cable shorter than 20m, a device can obtain maximum power saving because the GSD-1603 would automatically detect the Ethernet cable length and diminish power usage. The connected device can substantially reduce the overall power consumption, which makes a significant contribution to energy saving. 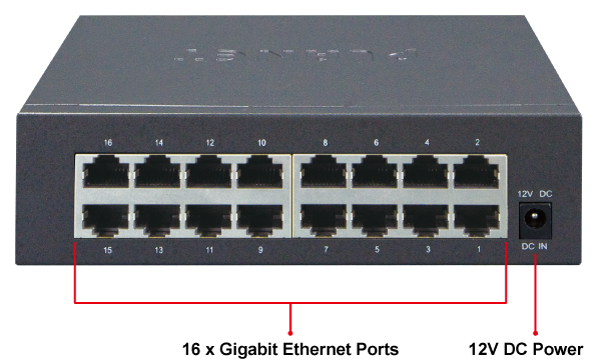 The GSD-1603 has an 8K MAC address table, featuring high performance switch architecture capable of providing the non-blocking 32Gbps switch fabric and wire-speed throughput as high as 23.8Mpps, which greatly simplifies the tasks of upgrading the LAN for catering to increasing bandwidth demands. 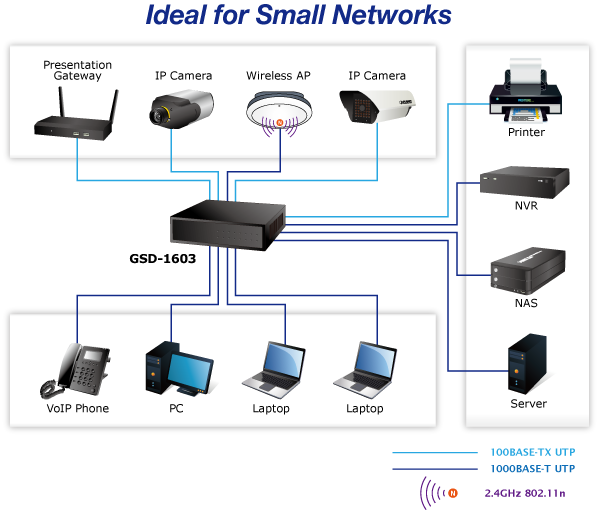 Besides, the 802.3x full-duplex flow control function of the GSD-1603 enables routers and servers to be directly connected to the switch for wire-speed packet transfer performance without the risk of packet loss. The GSD-1603 is the fancy-shaped standard plastic model to fit into a space-limited environment. Designed with compact size, fanless and noiseless features, the GSD-1603 is able to operate stably and quietly in any environment without affecting its performance. All RJ45 copper interfaces of the GSD-1603 support 10/100/1000Mbps auto-negotiation for optimal speed detection through RJ45 Category 5, 5e or 6 cables. They support standard auto-MDI/MDI-X feature which can detect the type of connection to any Ethernet device without requiring special straight-through or crossover cables. 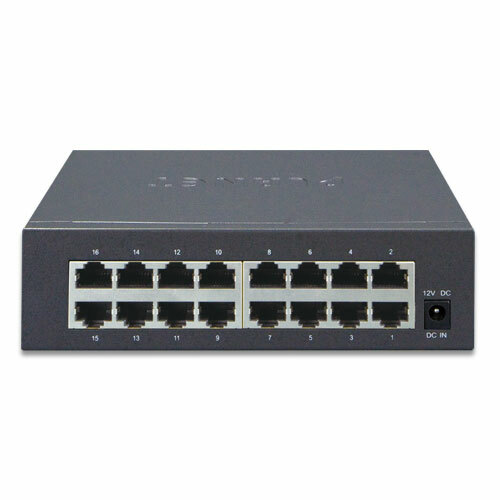 With up to 32 Gigabits per second of non-blocking switch fabric, the GSD-1603 Gigabit Ethernet Switch provides 16 Gigabit Ethernet Ports and is the best solution to the high-speed Internet environment demanded by SOHO/Home and Power users. The GSD-1603 accelerates the speed of data transmission between various Ethernet devices without worrying about the delay of high-quality multimedia display. 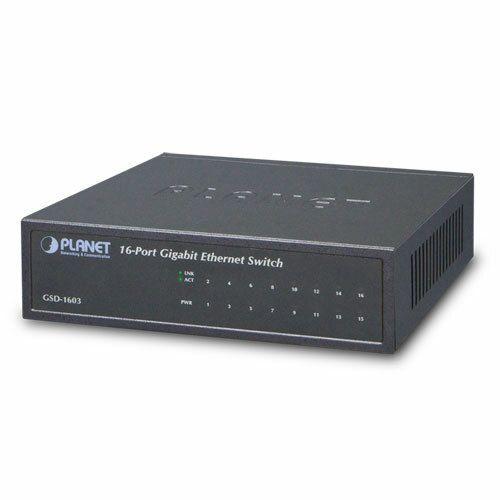 The GSD-1603 Gigabit Ethernet Switch helps enterprises or users to deploy a Gigabit Ethernet integrated data, voice network or to build a high-bandwidth switched network quickly and easily. 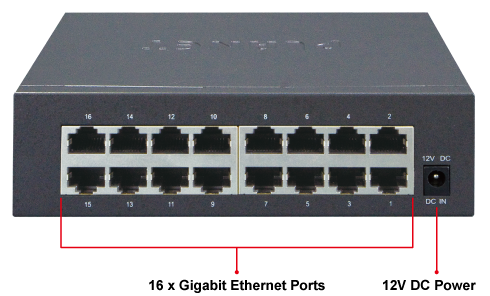 Based on uplink directly linked to the backbone switch over any straight-through or crossover cable, the GSD-1603 provides the connectivity to backplane yet segment the network traffic of the department to the core switch.